The base here includes six cloud-head feet, and in the middle underneath is carved a round and square seal. The upper one in relief is in clerical script in two lines and reads "Pure Curio of the Qianlong [Emperor]", while the lower one is engraved in two lines of seal script and reads "Presented to the Three Altruisms." 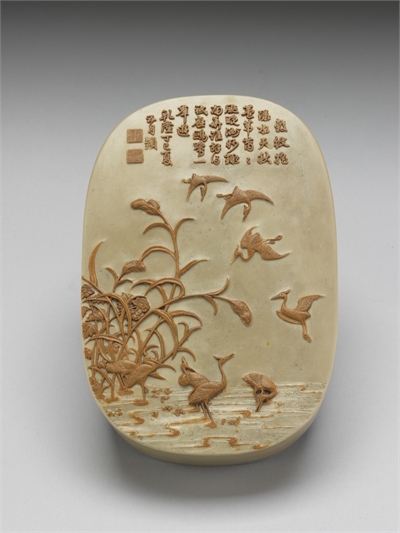 The cover is carved in relief with a scene of egrets and reeds as well as a poem by the Qianlong Emperor (r. 1736-1795). The inscription is in semi-cursive script and the contents echo the desolate scenery of the pictorial imagery. The inscription includes a date corresponding to 1737 along with two carved seals; one is engraved in two lines of seal script and reads "The One and Only Essence". 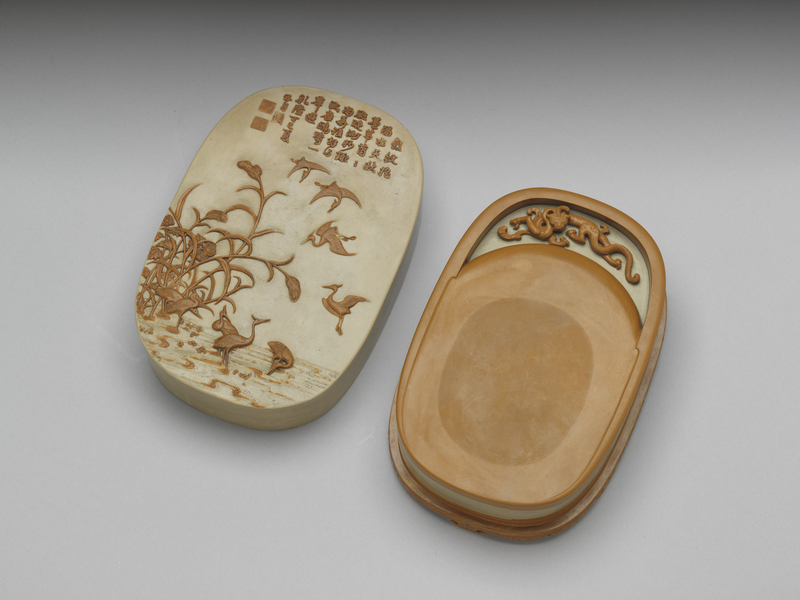 The other is a square seal in relief that reads "From the Qianlong Brush." 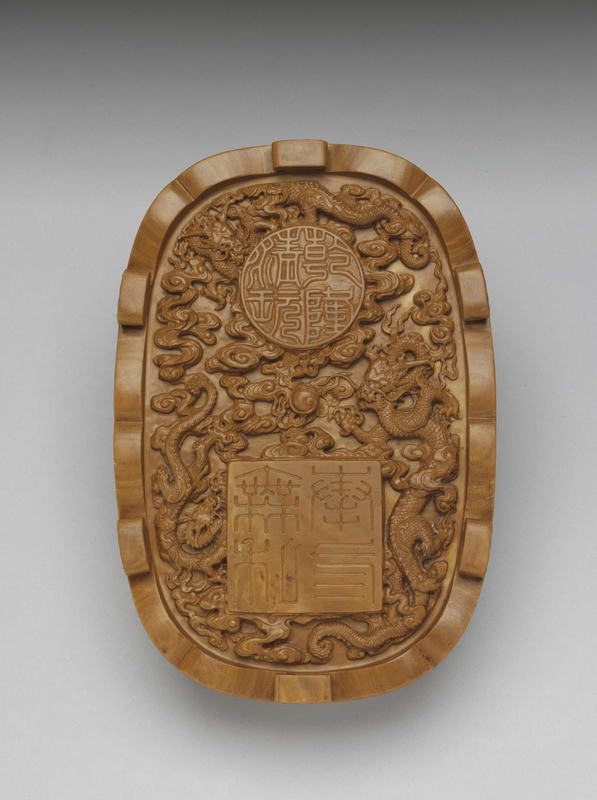 The inside of the cover is engraved with an inscription in regular script extolling the purity of the stone from which the inkstone was made and praising its refined carving. It also includes a square seal in seal script in two lines that reads "Eternally Treasured and Used." Songhua inkstone comes from the "area of Longxing" in the northeast and was especially prized by the Qing dynasty emperors, so commoners could not readily quarry the stone. For this reason, a Songhua inkstone became a prized gift coveted by officials and at court, and even was given as a state gift. 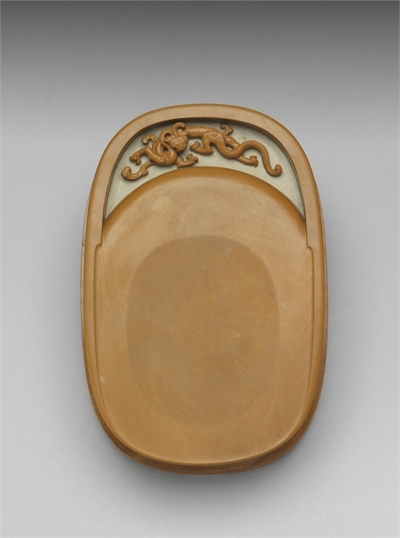 This inkstone is recorded in the "Xiqing Inkstone Manual" and thus was personally used by the Qianlong Emperor.